"Question: What will the CBCP do about it? Will it play blind, deaf and dumb to the scandal? Or will it give the issue formal attention and official action?" These were the questions posed by a former president of the Catholic Bishops' Conference of the Philippines (CBCP) concerning some bishops who had purportedly received gifts of Pajeros from the Arroyo administration. At least one bishop indicated he was ready to face an investigation. Some senators said bishops were not immune from criminal prosecution, with Sen. Panfilo Lacson saying: "No one is above the law, not even the bishops. If you have criminal liability, you can be charged." Archbishop Emeritus Oscar Cruz wanted the controversy included on the agenda of the CBCP plenary assembly this month. Cruz wrote: "With a heavy heart, do allow me to bring to your kind attention the above-cited matter begging for the official attention and formal action of the Conference as a whole." In a letter to the CBCP leadership, Cruz reminded fellow bishops that the existence of a "Malacañang diocese"which refers to a group of prelates closely identified with former President Gloria Macapagal-Arroyowas an open secret among them. The perceived and alleged existence of the so-called Malacañang Diocese in the CBCP brought to existence by the previous corrupt and corrupting administration is not really a secret, Cruz said in his one-page letter. The Philippines may qualify for the Washington-led Trans Pacific Partnership (TPP) agreement that will forge a high standard, broad-based regional treaty on trade and investments, the US government said Thursday. What the Philippines needs to do is institute reforms on corruption in the bureaucracy, reforms in the courts system, and promote good governance, said US Ambassador Harry Thomas. US President Barack Obama has identified the Philippines as one of four priority countries the US will support and push for enhanced partnership, according to the ambassador. Keeping mum was the response of several bishops to a call for them to confess that they were gifted with Mitsubishi Pajeros from the Philippine Charity Sweepstakes Office (PCSO) during the Arroyo administration. Those who have issued denials were bishops who did not get a vehicle from the charity agency. Senator Panfilo Lacson on Wednesday said he and Senator Teofisto Guingona III had obtained documents showing that four bishops and several congressmen benefited from PCSO funds. In Pangasinan province, a priest in the Lingayen-Dagupan archdiocese expressed disappointment over the decision of some bishops to accept vehicles from the PCSO, saying there is a very thin line between their motive in accepting the vehicles and the motive of the giver. “[They may say] that they accepted the high-end vehicles not for their own use but for the use of the diocese to carry out their apostolic work, but the giver may have another purpose—to buy their silence and cooperation,” said Fr. Oliver Mendoza, parish priest of San Fabian town. Reyes said he had an idea about the PCSO scam even before the exposé, based on the accounts of his fellows priests who supposedly noticed the lavish lifestyles of their bishops. The Palawan-based priest also recalled a bribery attempt exposed by his local bishop, Pedro Arigo, in 2006. Confirming that corruption exists in the Catholic Church, Reyes said the Church is a human institution that “is no different from the government." “But the Church is not only human. It is also divine," noted Reyes, describing the exposé as a “moment of grace." “God is giving us this embarrassment, this painful experience, so we can fall on our knees and beg Him for strength," he explained. The Philippine Charity Sweepstakes Office (PCSO) named yesterday a priest and several Catholic bishops who were given sports utility vehicles (SUVs) which the agency charged to its charity fund. Because of the new controversy hounding the agency, the Senate Blue Ribbon committee will investigate the alleged misuse of billions of PCSO funds during the Arroyo administration and other recently uncovered anomalies. PCSO director lawyer Aleta Tolentino distributed to newsmen copies of resolutions approving the grant of vehicles for the diocese of Butuan, North Cotabato, Sorsogon and Iligan City. In a series of resolutions in 2009, the former PCSO board approved the grant of two SUVs to Butuan City Bishop Juan de Dios Pueblos, one each for Rev. Orlando Quevedo of Cotabato, Monsignor Augusto Laban of Sorsogon and Fr. Roger Lood of the parish of Iligan City. Senate sets probe into alleged "PCSO bribes"
A number of former and incumbent congressmen, bishops, and other big personalities, who allegedly received bribes from the Philippine Charity Sweepstakes Office (PCSO) during the past administration, will be unmasked when the Senate blue ribbon committee holds an investigation on the issue next week. The Senate investigation next Wednesday was prompted by a joint resolution filed by Senators Panfilo Lacson and Teofisto Guingona III. In one district also, Lacson said, a congressman allied with former President and now Pampanga Representative Gloria Macapagal-Arroyo, supposedly got P55 million from the PCSO. Two priests and a lay leader have come forward to deny an Inquirer report insinuating that the Archdiocese of Ozamiz, through Archbishop Jesus Dosado, received a Pajero from the Philippine Charity Sweepstakes Office under the Arroyo administration. Fr. Marvin Osmeña, administrator of the Immaculate Conception Cathedral and custodian of church properties, said Dosado was never a recipient of any such bounty from the Arroyo administration. Activist priest Fr. Robert Reyes on Tuesday alleged that a number of Catholic bishops not only got expensive vehicles out of public funds but also benefited in other forms during the presidency of Gloria Macapagal-Arroyo. He said the Church’s weakness was exploited by a president who knew how to silence moral and spiritual leaders through corruption. Reyes, who claimed to have an idea who these bishops were, said the practice of taking donations from Arroyo thrived, not only before she stepped down, but also during the “crisis points” of the past administration. He said the money, used for “donations” to the churches, did not only come from the presidential or emergency fund, but also from the buckets of the PCSO and Pagcor. The latter agency, in turn, has divided Church leaders on whether to support gambling or not. Reyes said the creation of the Presidential Advisers on Ecclesiastical Affairs was also for Arroyo to have a better insight of who among the bishops most likely needed vehicles or church buildings. “The vital and fundamental role of the Church is to complain and set the records straight (in government). We (were) weakened as an institution because of this,” he said. He said with the auditing of the expenditures of the past administration, it was time for the Church to come clean, by urging the bishops involved to return the Pajeros to the government. A ‘whistleblower’ and rank-and-file employee of DepEd in Taguig City says that she was part of an illegal consortium that fixed contracts and that the Bids and Awards Committee (BAC) members of the local government’s procurement department, along with several local DepEd officials have been in collusion with favored contractors in the construction of school buildings in exchange for large kickbacks. President Aquino won the presidency on a battle cry to crush corruption and ease deep poverty, but a year into his term he is seen by many to be straining under the weight of his own promises...Aquinos popularity rating dropped from a peak of 74 percent in November to 64 percent in June...While his ratings are still relatively strong, analysts said the slide reflected disappointment that he had not done more to fulfill his chief campaign promises of eradicating corruption and ending poverty..."The bar was set very high for him, and from the very start the cards were stacked against him," said Antonio Contreras, a political scientist at De La Salle University. "He was painted as a symbol of clean government, a hope for a country after a disastrous administration." Contreras said that while he was disappointed overall with Aquinos first-year performance, the President had at least brought back a sense of ethics and professionalism in public service. Aquino remains almost unanimously regarded as personally incorruptible and voters feel comfortable he will not use his six years in power to build a personal fortune. This holds particular importance in the Philippines where leaders from national to village level have for decades sought to pilfer state coffers for personal benefit...Contreras and other analysts said Aquino had not yet started to tackle the roots of the country's corruption and poverty problems, and those were the issues he would ultimately be judged on. "All he has done is to start off his year with symbolic stuff, crushing corruption, but nothing really concrete yet"
The Management Association of the Philippines has drawn up more than 200 recommendations on 25 different sectors and issues for possible inclusion in President Aquino's upcoming State of the Nation Address...MAP president Felino Palafox Jr. said the country could increase its competitiveness by focusing on three key issues: corruption, criminality and climate change...He said property developers from the Chamber of Real Estate and Builders Association (CREBA) and the Subdivision Housing Developers Association Inc. (SHEDA) are already complaining that corruption is getting worse..."The per square meter of corruption is getting worse"...On infrastructure, he said, some contractors are complaining that the 20 percent kickback on projects funded by "pork barrels" is still an SOP (standard operating procedure). CUSTOMS TO LAUNCH INTEL SYSTEM: Undervalued and misdeclared goods entering the country will soon be easier to monitor with the imminent full implementation of the Philippine Customs Intelligence System Project (PCIS). Customs Commissioner Angelito Alvarez has ordered the immediate execution of all conditions tied to the Japan International Cooperation Agency (JICA) grant, which will finance the implementation of a customs intelligence system anchored on a database platform. The system will store, gather and systematically retrieve all data on customs transactions, allowing a quick check on all importations and shipments. Friends in media of then President Gloria Macapagal-Arroyo got hefty kickbacks from advertising placements of the Philippine Charity Sweepstakes Office (PCSO) on their radio programs, television shows or newspapers, the new PCSO management said. PCSO Chair Margarita Juico said the commissions ranged from 40 percent to 50 percent of the ad budget. The media personalities themselves put up the ad agencies to facilitate their commissions...Juico said the PCSOs advertising budget had grown exponentially from only P319 million in 2001 to P1.7 billion in 2010, an election year. Juico, who met recently with Inquirer editors and reporters, said that after a year of housecleaning, her legal team had come up with records showing how Arroyo used agency funds to line the pockets of her media friends and allies in Congress. She said Arroyo also lavished funds of the charity agency on allies in the House of Representatives at the height of moves to oust her. Most of these congressmen were those who voted against her impeachment. She used (PCSO funds) like a pork barrel, Juico said. In its 2008 audit report on the PCSO, the Commission on Audit (COA) said the nearly P529.45 million the agency paid for advertising contracts that year was too much. The COA said the advertising money could have been used to help the less fortunate instead...The audit agency noted that the PCSO placed excessive advertisements in mediasometimes over 20 spots per day on the same TV or radio stationleading to the unnecessary spending of public money. The COA also said the charity agency placed ad placements based not on a single media plan, but on requests from TV and radio stations...As early as 2005, the COA had already warned the PCSO not only about its unusually high ad expenses (it said that being a monopoly business, a reduction in ad expenses would hardly impact its sales), but also about its practice of charging expenses to next years budget (which enabled it to hide the fact that it was losing P89 million as early as 2003)...The COA also found something amiss in the issuance of checks worth P7.043 million in the names of members of the House, representing the 2.5-percent share of their districts from the STL Charity Fund. The COA said that by doing this, the PCSO could not have closely monitored the amount if the money was used for medical and health programs as required. The audit agency said the PCSO should have released the funds to hospitals, health facilities and other institutions chosen by the lawmakers. The kickbacks came amid overspending on advertising by the charity agency whose board was packed with media personalities, Juico said. Former Solicitor General Francisco Chavez filed a second complaint for plunder against former president now Pampanga 2nd District Representative Gloria Macapagal Arroyo with the Department of Justice(DOJ), this time, for the disbursement of some P2.3-billion in public funds for the purchase of farm inputs, including fertilizers The 31-page complaint includes the more familiar P728-million fertilizer fund scam, plus, a larger P1.7-billion disbursement, also for the Arroyo administration's Ginintuang Masagana Ani Program. "While ostensibly marketed as funding for the benefit of farmers, the foregoing amounts were actually intended for distribution to several public officials -- including mayors, governors, and members of the House of Representatives -- who were listed as 'proponents' of projects under the 'Ginintuang Masaganang Ani Program' and who were supposed to use the funds so distributed for the 'purchase of farm inputs' required by their respective projects," the complaint read. Click here to read GMA NEWS article: "Arroyo faces P1.59 B plunder raps over fertilizer scam"
The Presidential Commission on Good Government (PCGG) asked the Supreme Court (SC) to compel San Miguel Corp (SMC) to deliver to the government some P17.65 billion worth of shares in the food and beverage company pursuant to an earlier final and executory resolution of the High Court..."These Sandiganbayan resolutions became final and executory after the Supreme Court dismissed the petition of SMC on September 14, 2000 and affirmed the said rulings," the PCGG said in its motion. PCGG commissioner proposes anti-corruption roadmap: Philippine Commission on Good Government (PCGG) associate commissioner Gerard Mosquera is suggesting a seven-year roadmap to fight corruption in the government. "To fight corruption, we need a roadmap that focuses on a three-pronged approach to corruption: deterrence, prevention and education of the public as well as an agency to implement it"..."During the first phase, or first six months, it could bring quick successes by arresting 25 high profile public officials for corruption to show the government is serious about the job; during the second phase or first three years, institute transparency reforms and forge multi-sectoral partnerships, and during the third phase, from the third to seventh year, implement a long-term public education program about the prevention and deterrence of corruption"
BISHOPS TO AQUINO: STOP WHINING, START FILING CASES VS GMA, ALLIES >>> Instead of whining about the mistakes of the past administration, the Aquino government must start taking steps against the alleged corruption committed by its predecessor, Catholic bishops advised the government...Two prelates gave their two cents' worth following a disclosure by officials of the Philippine Charity Sweepstakes Office (PCSO) that former President Gloria Macapagal-Arroyo and her allies left the agency P4 billion in debt due to sham media contracts and fake medical claims. ARROYO LEFT P4b INDEBTEDNESS TO CHARITY SWEEPSTAKES OFFICE: Then President Gloria Macapagal-Arroyo and her allies used the Philippine Charity Sweepstakes Office (PCSO) as their milking cow, leaving the agency P4 billion in debt, or close to a year's worth of doles for the poor and the sick. "They ran it to the ground," said PCSO Chair Margarita Juico, who recently met with Inquirer editors and reporters. Juico said the directors appointed by Arroyo to the PCSO board "comingled" the funds for operating expenses with those for charity work, thus allowing the agency to spend more than its budget, especially in the last two years in office of the appointees. ROBREDO CLARIFIES HOW LOCAL GOVERNMENTS CAN USE INTERNAL REVENUE ALLOTMENT FUNDS: Department of the Interior and Local and Government (DILG) Secretary Jesse M. Robredo allayed fears of local chief executives (LCEs) over the use of the 20 percent development funds sourced from the Internal Revenue Allotment (IRA), saying that it can be paid for expenses that are "connected to or related with" the implementation of a particular development project. "For example, if a local government unit (LGU) is engaged in a road construction project, the cost of labor and other related expenses that would be incurred for that project can be charged to the 20 percent development funds,"
ROBREDO: 182 GOVERNMENTS, MAYORS MISUSED DEVELOPMENT FUNDS >>> Some 182 governors and mayors "misused" their 20 percent development funds sourced from the Internal Revenue Allotment (IRA), Interior and Local Government Secretary Jesse Robredo said...according to the Commission on Audit (COA), 80 of the 182 local government units (LGUs) utilized the fund for regular expenses such as salaries and wages, maintenance of facilities, traveling, celebration of festivities, and financial assistance. "The COA reported that 102 other LGUs did not implement or fully implement the development projects funded as shown by an unutilized balance of a total of P650.6 million," Robredo said...the COA audit evaluated a compendium of 1,351 Annual Audit Reports (AARs) of the LGUs for 2008 and covered various areas of local government operations. The evaluation included the 20 percent development fund, economic enterprises, and accounts property, plants and equipment, and cash advances because of their significant balances. DETAILS OF P 34m PAGCOR, COSETENG CHARGES: Charged before the Office of the Ombudsman were Genuino, ex-PAGCOR President/COO Rafael "Butch" Francisco, former Directors Philip Lo, Manuel Roxas and Danilo Gozo, former Executive Vice President Rene Figueroa, ex-VP for Accounting Department Ester Hernandez, ex-VP for Corporate Communications and Services Department Edward "Dodie" King, and former AVP for Internal Audit Department Valente Custodio. In the separate complaint filed by Coseteng and Papa and other sports advocates, Genuino et al. are charged with graft and corruption as well as violations of the Forfeiture Law and Anti-Money Laundering Act. Ex-PAGCOR officials are charged together with former Philippine Sports Commission (PSC) Chairman William Ramirez and PASA President Mark Joseph. Atty. Harry Roque, the Cosetent-Papa group's legal counsel, pointed out that "this is not just malversation of public funds. It's about destroying the dreams of young athletes. It's unforgiveable that money allotted by law for sports and youth development went to the private pocket of former PAGCOR Chairman Efraim Genuino." AQUINO RECEIVES GOOD GRADES ON CORRUPTION EFFORTS: President Benigno Aquino III has received a passing mark from some sectors for his first year in office. President Aquino's anti-corruption measures have so far been described as "successful." Harvey Keh, the lead convenor of the Kaya Natin! Movement for Good Governance and Ethical Leadership, gave the President a grade of 85%, which, for him, is "not a failing grade but not too high." "So far, his anti-corruption measures are successful More improvement in running the bureaucracy," Keh said. Deputy House speaker Lorenzo "Erin" Tañada III also believes that Aquino "has fulfilled much of his promises such as anti-corruption measures." Political analyst Ramon Casiple, meanwhile, gave Aquino a grade of 6 for his first year in office. Casiple lauded the Aquino administration for employing measures to stop corruption and for taking initiatives toward what the administration calls a "matuwid na daan (straight path)." ...The Presidents controversial appointments, like the case of Land Transportation Office chief Virginia Torres and Interior and Local Government Undersecretary Rico Puno, have marred his administration in his first year as well as his lack of a long term plan. JUSTICE CHIEF: JOURNALISTS "MIRROR OF TRUTH" >>> Justice Secretary Leila de Lima on Wednesday congratulated the members of the media and called them the "mirror of truth" for the community...She said news reports and commentaries criticizing local politicians for alleged corruption and irregularities have been the main reason for a slew of assassinations targeting journalists. Rowena Paraan, secretary-general of the National Union of Journalists of the Philippines (NUJP) said fewer than 10 people have been convicted in about 145 media killings since 1986 when democracy was restored. Out of the 145 deaths, more than 100 occurred since 2001. SANDIGANBAYAN SAYS OLD MARCOS P 22m CASE WAS "ABANDONED" BY PROSECUTORS: A former economic adviser of Ferdinand Marcos walks away free after the Office of the Ombudsman seemed to have abandoned the case of some "missing" P22 million fund. Sandiganbayan Second Division acquitted Juan Roberto Abling, former chief of the Economic Support Fund (ESF), after prosecutors failed to show that he pocketed money after withdrawing them and giving a portion to the deposed dictator. The Sandiganbayan pointed out in its 27-page decision that prosecutors failed to present enough evidence to indict the former official. "Nothing in the records would show or otherwise suggest that the accused has appropriated for his benefit the amount of P22,000,000," the Sandiganbayan ruling noted. Abling said that he withdrew P35 million and gave Marcos a total of P22 million after Marcos instructed him to withdraw funds from the ESF. In the trial, Abling presented memoranda from Marcos reflecting the dictator's signature as a confirmation of the receipt of the P22 million. Through an audit of the Commission on Audit, the missing P22 million was revealed. Case relative to the missing multimillion peso was only lodged at the Sandiganbayan August 1995. But in a turn of events, the Ombudsman seemed to have left the case in open water. The anti-graft court said that the prosecutors "abandoned" the case. AGUSAN DEL NORTE GOVERNOR ARRESTED IN LANDMARK CASE: An influential governor was arrested on corruption charges on Thursday, officials said, in what one legal analyst said could be a test case for President Benigno Aquino III's war on graft. Governor Erlpe John Amante and 2 other defendants posted bail hours later but face up to 15 years in jail if found guilty on charges of allowing a firm mine and export nickel ore beyond its permitted amount, they said. Amante and 2 other local officials allegedly committed the crime in 2006-2007 in the southern province of Agusan del Norte -- a powerbase for his family, said Rawnsle Lopez of the special anti-graft prosecutor's office. "We consider this to be a high-profile case because a governor is a chief executive of a province," Lopez, spokeswoman for the government Ombudsman told AFP. P-NOY CITES PUBLIC WORKS SAVINGS THROUGH JUDICIOUSNESS AND PRUDENCE: President Aquino expects a windfall of around P7 billion from the former corruption-mired Department of Public Works and Highways, which would form part of the "savings" his administration will achieve due to judicious and prudent spending...This is because of the competent and honest leadership of its head, Secretary Rogelio Singson. The President said that DPWH now has become a model for honest and straightforward governance, coupled with a serious concern for the public. Among the reforms Singson implemented are a transparent and stricter bidding process...out of the P3.5-billion post-Ondoy and Pepeng contracts (November 2009) that dealt with 86 contracts, 19 of the projects have already been cancelled due to dubious circumstances, among them the absence of bidding and the involvement of politics..."No doubt, the image of the DPWH as being one of the most corrupt agencies in government is slowly being erased, as we go on through the straight path under my administration, which is a new chapter in the history of this agency," he said. CARPIO-MORALES: I HAVE STRONG MORAL FIBER TO BECOME OMBUDSMAN >>> Retired Supreme Court (SC) justice Conchita Carpio-Morales said yesterday she's fit for the Ombudsman portfolio. The former magistrate, who penned the SC ruling that paved the way for the impeachment of former ombudsman Merceditas Gutierrez in the House of Representatives and also took from Chief Justice Renato Corona the privilege to administer the inaugural oath of President Aquino last year, cited "strong moral fiber" as her edge over 26 other bets. "I feel I have the moral fiber to prosecute those who ought to be prosecuted and to ward off extra-legal factors that impede the proceedings," she told the council upon questioning of retired justice Aurora Lagman, a regular JBC member...If appointed ombudsman, she said she would first make an inventory of cases and personnel in the anti-graft office to be able to institute necessary reforms. She vowed not to allow delay in disposition of graft cases and revealed that she would order a reorientation of special prosecutors immediately. APOSTOL LASHES OUT AT MERCI, SANTIAGO: With Merceditas Gutierrez out as Ombudsman, Deputy Ombudsman for the Visayas Pelagio Apostol finally found his voice. During a book launching at the Cebu Grand Convention Center yesterday, Apostol lashed out at Gutierrez for allegedly favoring Asst. Ombudsman Virginia Palanca-Santiago and concentrating the exercise of power to a select few anti-graft officials. Apostol will be interviewed by the Judicial and Bar Council today for his application to the Ombudsman post. Santiago declined to comment further on Apostols allegation, saying she was merely following orders from Gutierrez. Apostol spoke out his grievances in the launching of the book titled What Went Wrong in the Office of the Ombudsman and How We Can Move Forward? Since assuming post in Aug. 21, 2007, Apostol said he never experienced a meeting with anti-graft officials. When his request for a meeting with other anti-graft officials was submitted to Gutierrez, she reportedly turned it down. OMBUDSMAN CANDIDATES PLEDGE FIGHT VS GRAFT - Justice Undersecretary Leah Armamento and former Regional Trial Court judge Alfredo Agawa, the first candidates interviewed by members of the Judicial Bar Council for the Ombudsman post, pledged to regain the credibility of the office. AQUINO NEEDS TO START DELIVERING, BUSINESS GROUPS SAY - Two of the country's most influential business groups said they'll give President Benigno Aquino III a pass on his first year but expect action in the next. Aquino marks his first year in office next week and the country's two biggest survey organizations say his numbers have dropped about 10 points from his first months in office. ON THE eve of his interview with the Judicial and Bar Council (JBC), Pelagio Apostol, incumbent deputy ombudsman for the Visayas and applicant for the post of Tanodbayan, criticized the office he wants to one day lead. “Unless we recognize the problem, we cannot solve the problem,” he said to justify the criticism expressed during book launching attended by co-workers, fellow government executives, judges, lawyers, and representatives from civil society organizations..One of Apostol’s criticisms was the delay in the resolution of cases at the Central Office. He blamed this on an order, issued by then Tanodbayan Merceditas Gutierrez when she assumed office in October 2005. The order, he said, was designed to “control the outcome of cases without regard to merits” and which, in the process, “reduced and mangled the powers and functions of deputies.”...He alleged that amid glaring evidence of the delay, particularly numerous follow-up queries, higher-ups inititated attempts at a cover-up. First, Apostol said, the central office issued a memorandum barring sectoral offices from telling parties when their cases were forwarded to Manila. Then, in a meeting in November last year, Overall Deputy Ombudsman Orlando Casimiro declared there was no delay in the resolution of cases at the anti-graft office, Apostol said. He also lamented that his own anti-corruption efforts were undermined. He cited how he was shut out from certain processes, such as involvement in the selection of key officials and the proceedings at the Internal Affairs Board. The Office of the Ombudsman-Visayas launched an anti-corruption book entitled “Kakistocracy: Rule of the Unprincipled, Unethical, and Unqualified” on Tuesday at the Cebu Grand Covention Center, Banilad, Cebu City. Dr. Ronnie Amorado who is currently the national coordinator of the Ehem Anti-Corruption Group of the Philippines wrote the book. 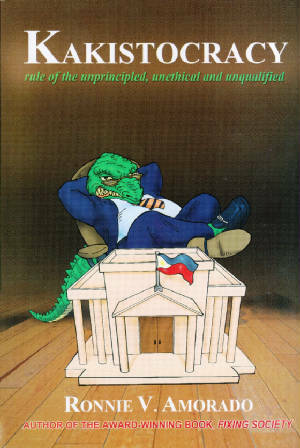 The book tackles corruption in the PHL government and its initiatives to restore public trust. This activity is in line with the campaign against corruption as one of the major thrusts of the Aquino administration. Dr. Amorado is a member of the Society of Jesus that advocates a process of self-check and cultural reforms in the fight against corruption in thePhilippines. “Kakistocracy” is the product of Dr. Amorado’s research on leadership, citizenship and corruption in the United States as a Hubert H. Humphrey’s Fellow in 2009-2010. This is also a sequel to his first book entitled “Fixing Society” that came out in 2007. The Philippines Integrity Project financed by the United States Agency for International Development (USAID) co-sponsored the book launching along with the Visayas Executives Council of Leaders (VECL), Visayas Resident Ombudsmen Council of Leaders (VROCL), Visayas Federation of Corruption Prevention units (VFCPU) and other organizations. EHEM, AHEM! Anti-Corruption Network and other anti-corruption partners of the Office of the Ombudsman-Visayas also supported the activity. US Ambasador Harry Thomas Jr. has urged the Philippine government to remain vigilant against human trafficking after it had been removed from Tier 2 of the human trafficking watchlist. De La Salle University law school dean Jose Manuel Diokno denied being a "communist lawyer" as he faced the Judicial and Bar Council (JBC) on Monday for his bid to become the next ombudsman. Ombudsman-Visayas clears Cebu City Councilor and Kamputhaw barangay captain of criminal and administrative charges in connection with hiring of legal counsel of Kamputhaw. CONCRETE REFORMS are now expected from the government, businessmen said as they noted efforts by President Benigno S. C. Aquino III to lay the groundwork for his pledges to grow the economy and combat corruption. Ex-asst Ombudsman faces probe for "tampering"
Archbishop Emeritus Oscar Cruz, a staunch antigambling advocate, urged colleagues in the Church to come clean and openly admit if they were among the seven bishops reported to have received Mitsubishi Pajeros from the Arroyo administration. Former top officials of the National Power Corporation are facing graft and malversation charges before the Sandiganbayan for allegedly paying P124 million to the supposedly unauthorized foreign representatives of a Philippine company in 2003. Government corporate lawyers must face probe for giving the Philippine Charity Sweepstakes Office (PCSO) the go signal to pay movie director Carlo J. Caparas over P1.2 billion for the production of a television drama series. Darlene Pajarito, a prosecutor in Zamboanga City, has been included in the 2011 US Trafficking in Persons (TIP) report as one of the heroes in the fight against human trafficking...one of those who "have devoted their lives to the fight against human trafficking." Former Philippine Charity Sweepstakes Office chair says that instead of making baseless accusations against him and other members of the previous PCSO board, current PCSO Chair Margarita Juico should just file a case in court and end the "trial by publicity." Of the top 5 government officials, Filipinos trusted Vice President Jejomar Binay the most, and Chief Justice Renato Corona the least, according to a Pulse Asia survey. Ombudsman asks Cebu Governor Gwendolyn Garcia to answer supplementary complaint of Manuel Manuel on issue against the Capitol officials involving the purchase of the Balili lands in Naga...Manuel alleged that Garcia was authorized by the Board to officially facilitate the "illegal purchase" of the over 24-hectare property in barangay Tinaan, Naga City in the amount of P98 million on April 20, 2008. Last week a World Bank team from its Integrity Vicepresidency provided a four-day training course in forensic accounting to about 900 auditors of the Commission on Audit. The program, which has also been done in several African countries, will enhance COA auditors' capability to detect corruption and other criminal activities in the course of their work. Senate Minority Leader Alan Peter Cayetano: Aquino administration "lacking" in holding past administration accountable for alleged corruption. Retired Supreme Court Associate Justice Conchita Carpio-Morales laid down the steps she would do if appointed to the post vacated by Ombudsman Merceditas Gutierrez, including crafting information and trial preparations to ensure a higher rate of successful prosecution of erring government officials. A Malacañang official failed to liquidate over P1.2 million in cash advances last year, the Commission on Audit has reported. However, the unnamed media accreditation and relations officer of the News and Information Bureau (NIB) said her 'busy schedule' prevented her from making the liquidation. The SandiganBayan has acquitted a former economic official of the Marcos regime linked to missing intelligence funds. The anti-graft court acquitted Juan Roberto L. Abling for lack of sufficient evidence to prove that he pocketed the P22 million in intelligence funds before the 1986 snap elections. The Presidential Commission on Good Government wants to reverse the alleged grossly disadvantageous sale of a prime P4.3-billion state-owned lot in Pasig City to an affiliate of property giant SM Development Corp. in 2009. A graft investigator and an associate commissioner of the Presidential Commission on Good Government (PCGG) topped the Judicial and Bar Council's (JBC) shortlist for the position vacated by Deputy Ombudsman for Luzon Mark Jalandoni, a member of the council said today. The Office of the Ombudsman has ordered the filing of charges against two revenue officials based on a complaint filed by a unit of the Department of Finance, the department said in a statement yesterday. The Ombudsman ordered the filing of charges against Artemio Aquino, a revenue officer assigned in Valenzuela, and Mama Bae Marzoc, regional director of Bureau of Internal Revenue's office in Cotabato. The Sandiganbayan has convicted Leyte Mayor Arnold James Ysidoro and a former mayor of Nueva Vizcaya for graft. In a decision, the court's second division found Ysidoro guilty for illegal use of public funds, punishable by 6 to 12 years in prison. The Philippine Government Electronic Procurement System (PhilGEPS), the country’s online procurement portal that is widely touted and cited as a model for other countries to follow, has apparently failed to protect the bidding process from corruption within the Department of Education (DepEd) and other public agencies in Taguig City. She claims that far from being short of money, the DepEd is awash with public funds –but they are being lost to well-organized corruption. Employees in a constitutionally-mandated agency established to monitor and check on departmental spending are also said to be involved. DepEd officials in Taguig are counter-charging that the informant has actually been extorting money from contractors and blackening the reputation of colleagues through her claims. ...scarce public funds that should be invested strategically in developing promising local industries in areas of critical need are instead "wasted" in propagating political patronage through the "pork barrel" system. ...successive administrations are squandering the country's long-term economic development for short term political gain. ...a vicious circle that needs to be cut if the Philippines is to ever maximize its real potential. The "pork barrel" or the Priority Development and Assistance Fund (PDAF) is...the special allocation given to lawmakers to finance projects in their respective localities that usually don't get prioritized in the national budget. The more than 200 lawmakers at the House of Representatives are each given PhP 70 million (USD 1.63 million) in PDAF, while their counterparts at the Senate are entitled to a bigger PhP 200 million (USD 4.65 million) each. Based on this year's General Appropriations Act (GAA) of 2011, the government has allotted a total of PhP 24.62 billion (USD 572 million) for the PDAF PhP 4.6 billion (USD 107 million) for the 23 senators and a little over PhP 20 million (USD 465,116) for the 285 congressmen. After a lawmaker identifies a set of projects where his or her PDAF would be spent, the special fund is immediately divided and distributed to several implementing agencies --most often to the Department of Public Works and Highways, Department of Education, and the Department of Health -- as well as the local government units, which would also be tasked to carry out the lawmaker's program. But since its institution in 2000, the PDAF...has been the subject of criticisms allegedly for the lack of transparency in the disbursement of the special fund. Dolores Español of the Transparency International-Philippines admitted the PDAF system should not have been created in the first place. "The pork barrel system is subject to abuse. Personally, I think that is a waste of public funds. Instead of going to the sector for which it is intended, the money gets dissipated and the people do not benefit from it," Español told the Philippine Public Transparency Reporting Project in an interview. POWER, CHARACTER AND LEADERSHIP:..We need to acknowledge and break out of our own amoral familistic tendencies. We need to learn to say no to our family, relatives and close friends when saying yes means betraying our oath of duty to our community. May it strengthen us to decline offers of bribes when accepting them means shattering the promise of our youth. He/she must be courageous enough to ensure that heads would roll. After conducting an honest and fair assessment of the people in the organization, most especially, those who occupy managerial or supervisory positions, the new ombudsman will be able to determine who could be assets or liabilities to the organization. Next in the agenda must be the filing of forfeiture case against Hernando “Nani” Perez which the previous leadership decided to hold in abeyance. .. The actions of the new ombudsman on the foregoing cases would serve as his/her baptism of fire. These would spell the degree of his/her sincerity to stamp out corruption. These would also be the gauge for the civil society and the public in general in deciding whether to give the new ombudsman their full trust and support. Click here to read full Newsbreak "Starter Guide for the new Ombudsman" including a list of 11 "things to do" written by an anonymous former OMB official. FOCUSING ON OUTCOMES: ...a legitimate criticism of President Aquino is that, one entire year into his term, he still has not filed -- despite all the alleged plundering shenanigans of Mrs. Arroyo and despite all of Mr. Aquino's campaign promises and slogans -- even a single corruption case against Mrs. Arroyo. Considering that Mr. Aquino made fighting corruption his main campaign platform -- "Kung walang corrupt, walang mahirap" -- how does this seeming inaction stack up against it? If he is unable to build legal cases against the supposedly corrupt Mrs. Arroyo, what does this mean for his much touted "daang matuwid" ("straight road")? Are we on it or off it? It is one thing to talk about a "corruption-free" society, as Mr. Aquino did again at the Independence Day celebrations last June 12th, it is quite another to make it happen. Reading a speech is as easy as, say, playing a video game. Actually attacking corruption in this country requires a long attention span, a well thought-out program, and a serious commitment to old-fashioned hard work. In the first year of Mr. Aquino's presidency, one is hard-pressed to see any evidence of these. We've all already heard what he's promising. We now want to see what hes doing about what's hes saying. We want to see his promises transformed into actions, his actions into outcomes. If Mr. Aquino wants to be taken seriously as president, he has, at some point, to seriously walk his talk and achieve desirable outcomes. Otherwise, he will always be perceived as simply a cardboard cutout with a voice recorder that spits out nice-sounding phrases. THE present, Aquino administration, Philippine Amusement and Gaming Corporation (PAGCOR) last week filed a criminal case against former chairman and CEO Efraim Genuino and ex-officials of the agency for graft and corruption related to PAGCOR's questionable direct funding assistance of more than P34 million to the Philippine Amateur Swimming Association, Inc. (PASA) beginning 2007. An official press statement from PAGCOR states the Commission on Audit's findings on the case. It reads, 'After a review of the submitted documents, COA wrote PAGCOR on January 18, 2010 stating the following: 1) There is no basis of authority for PAGCOR to release the funds directly to PASA instead of releasing to PSC as mandated by law; 2) The liquidation report submitted by PAGCOR is not signed/approved by the authorized PASA official; and 3) disbursements stated in the liquidation report in the total amount of P31,858,616.85 were not properly supported by documents." "Architect Palafox Jr., president of the Management Association of the Philippines (MAP), Sergio Ortiz Luis, president of the Philippine Chamber of Commerce and Industry (PCCI) and Peter Perfecto, executive director of the Makati Business Club (MBC) issued separate statements explaining the drop in the President’s ratings. There is rampant corruption going on in the Bureau of Customs. Unless and until the Customs zone is cleared of corrupt officers, President Aquino’s anti corruption campaign falls into Manila Bay." "...corruption continues unabated at the higher echelons. Officials of the Aquino administration are busy excavating, reviewing, and re-calculating done contracts and on-going projects to find out whether new arrangements or revised compensation package can still be extracted from project proponents and investors who have already coughed out enough to the previous Arroyo officials. For these reasons, reviews are being sorted out for more rice importations, which is easy money, and reviews of the Laguna Lake project, NAIA-3, Northrail, LTO computerization, MRT, and others presumably to find out if there is still enough juice left to squeeze out. When all is said and done, the corrupt practices of the Arroyo administration appear to be spilling over into the Aquino administration which could be embarrassing to well-meaning President Benigno Aquino III. 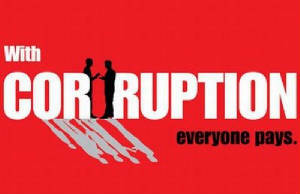 That is, same system; same corruption; and same people." The Philippines was arguably better off than our neighbors in East and Southeast Asia as we emerged from the devastation of World War II and centuries of colonialism. Our rampant corruption and bad governance, and social and economic backwardness today have been brought about mainly by leaders whose drive for power and wealth make them mostly self-serving in office, instead of being loyal public servants and moral leaders as well.